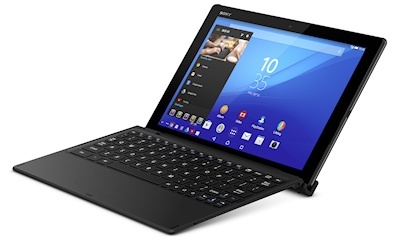 Prepare to be confused, because the Sony Xperia Z4 Tablet is not a follow-on from the Xperia Z3 Tablet, because that doesn't exist (unless you count the mini version), but instead it follows on from last year's Xperia Z2 Tablet. The reason for this somewhat odd naming convention is to keep the name of the tablets in step with Sony's flagship smartphone which is updated on a six-month cycle. The Z4 is quite an improvement over the Z2, with a 10.1" 2560 x 1600 pixel display compared to 1920 x 1200 on the old one. Inside is a octa-core 2GHz 64 bit processor with 3GB of RAM and 32GB of onboard flash plus a microSD slot, so it has a faster CPU and more storage. Inside is a 6000 mAh battery, as before, and it is a little slimmer and lighter than the previous model. On the back is an 8.1 megapixel camera, as before, but if you are mad about taking selfies with your tablet then you'll be pleased to know that there's now a 5 megapixel camera on the front. An FM radio is a nice touch, but perhaps one day we'll start seeing digital radios in this type of device as well. As ever, there are a variety of accessories that can go with the tablet. 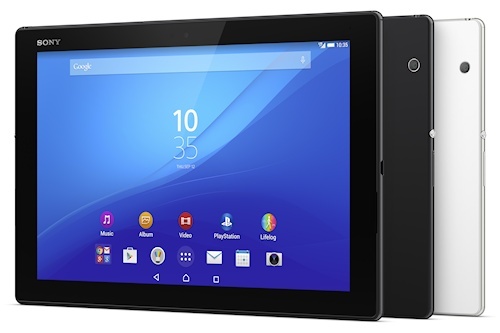 The Sony Xperia Z4 tablet is available in LTE or WiFi-only versions. As is typical for a Sony device, this is all metal and glass and Sony have made it waterproof and dustproof to IP65 and IP68 standards. This is an Android 5.0 device which has all the features you would expect in a high-end Android tablet, plus all the enhancements that make Sony tablets a bit more entertaining and slick than some rivals, such as PlayStation integration and excellent multimedia capabilities. Sony say that the Xperia Z4 Tablet should be available from June onwards in black or white colours. No guidance was given on price, but we would expect these to retail for around €500 to €600 depending on model.